Summer, fall, winter, spring--Smitten, Vermont, is the place for love . . . and mystery! There's a secret in Grandma Rose's attic--a forgotten set of dog tags belonging to her first love. But David Hutchins was killed in action and never returned to Smitten. How did the dog tags end up in the attic? The mystery intrigues Rose's three granddaughters--Tess, Clare, and Zoe--and they decide to investigate, though their mother, Anna, warns against meddling. But as the seasons turn and the mystery unravels, the three young women and their mother encounter some intriguing mystery men of their own. Has a sixty-year-old puzzle sparked something new for this close-knit family of women? Join popular romance novelists--and real-life BFFs--Colleen Coble, Kristin Billerbeck, Diann Hunt, and Denise Hunter for four delightful intertwined tales of mystery and sweet intrigue. Secretly Smitten is a fun contemporary romance set in the New England town of Smitten. 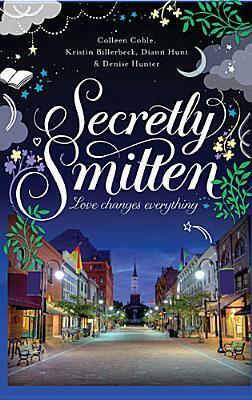 Secretly Smitten is the sequel and companion to Smitten released earlier in 2012. (Although I will note, I did not read Smitten and had no problem connecting to this book). The book is broken up into four novelas, one written by each author. The novellas are seperate reads but tie together nicely, each story flows into each other. The four stories are written about the daughter and Granddaughters in one family and how they each find love. I loved that each daughter had a drastically different personality and really was relatable and connectable individually. I never felt like one sister outshone the rest (although I personally related to Tess the most). It was interesting to read a book by four different authors. I expected each of the writing styles to be very different, but I was happily surprised to find that each author's style really complimented the next. These are lighthearted love stories- not meant to stress the reader, but to provide sweet stories that are romantic and clean. I found this book to be incredibly refreshing compared with the gothic reads that I have had lately- it was nice to read a book with light drama and sweet romance (I know I already said sweet but it really is the perfect word.) This book is Valentine's Day in a book. If it were a color- it would be pink. (Not red- that is too much explosive passion). I think if you are reading this, you get my point. I really enjoyed this book, and am planning on hunting down the first. The "gals" are celebrating the release of Secretly Smitten with a fun Live Webcast on February 5th. They'll be debuting the *NEW* animated Smitten trailer, giving away tons of prizes, dishing on the book and their friendship. They'll also be wrapping up the Secretly Smitten blog tour, answering audience questions and testing your trivia skills. Don't miss the fun and bring your friends. Click here to RSVP and set up a reminder.